Monday we went to a fantastical town where custard filled cakes are granted landmark status and aged cheeses sit out by the hundreds, where pan de maiz is baked on a bed of leaves before being piled into hand-woven baskets for sell on a chilly winter's day. We went to Zumarraga, and the chilly winter's day just happened to be Santa Lucía. The fair of Santa Lucía always falls on the 13th of December. The fair began as a place to buy and sell moxalak, Basque ponies. It used to last three days, with the farmers and vendors coming down from the mountains the day before the fair to set up, and spending that night in feast and festivity. Then there was the fair proper, and then the third day, which consisted of finishing up business, eating well (for the most succesful, there was besugo/sea bream and angulas/baby eels), and preparing the return. Nowadays, there are three days, with the first two including just a few activities, such as pelota games and wine tastings. The third day, el día de santa lucía, starts at 8am with horse exhibitions and "extraordinary markets" filled with every agricultural product imaginable. 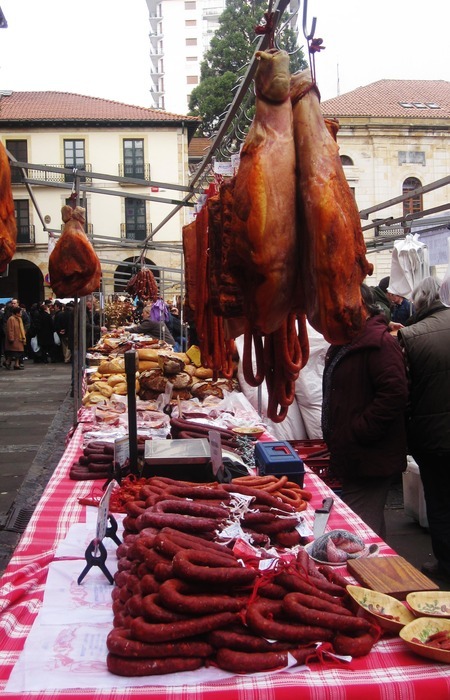 It is known to be the most important fair in Gipuzkoa, if not in all of Euskal Herria. And it is incredible. Honey of dozens of varieties, wheels of cheese for miles, homemade liquers with sloe berries floating in the botles, and huge, oversized produce (an apple weighing 1.2 kilos!). 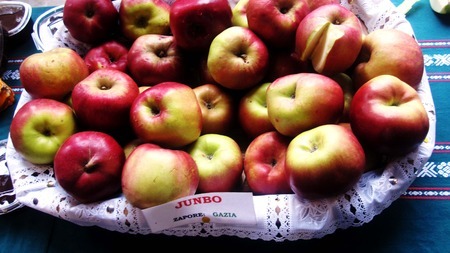 In 1960, and even in 1970, the country people of Obaba had an ancient air about them that made them appear to belong, in the strictest sense, to another country...they would look at the sacks full of various kinds of apple and be able to distinguish each sort: 'This one's espuru', 'this one's dementxa,' 'this one's gezeta.' ...But it wasn't just what they said, their ancient lexicon; it was also what they didn't say. Many words in frequent use now never left their lips. They simply didn't know them. When I go to Visalia to buy something at the mall or at the music shop I notice verbs like 'depress' or adjectives like 'obsessive' 'paranoid' or 'neurotic' are on everyone's lips, and are unavoidable in any conversation, whether personal or not. Well, I never heard them on the lips of Lubix, Pancho or Ubanbe. They would sum the situation up in two simple sentences: "I'm happy" or "I'm not happy." One thing not to be missed is the talo. 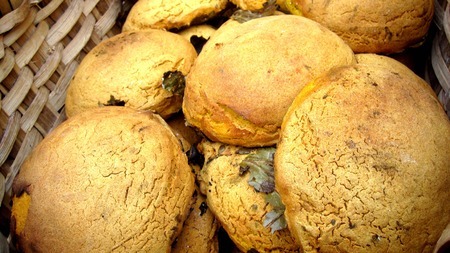 Talo is a pancake made from corn flour that is typical to the region at this time of year. Basques in traditional caserío gear mix flour and water in huge quantities and then share the work of pounding and shaping the dough into thin, round cakes. 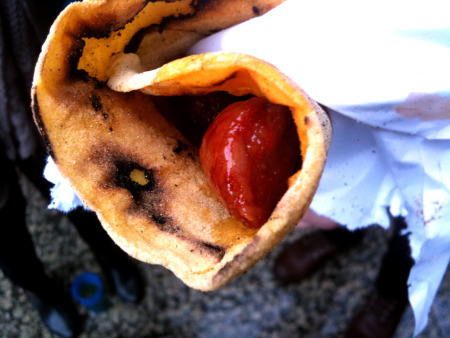 You can order the talo with txistorra, a thinner version of chorizo that is fast-cured and more tender. Some people add bacon, some add cheese, and others add chocolate. The typical txistorra talo runs you about four euro. While the first lady was mixing dough, and the circle of women rolled them out, another woman was manning three skillets which she dipped a huge chunk of animal fat into until the desired amount was rendered. Then she proceeded to add either txistorra or bacon and fry until just right. A sort of delivery man would then carry them over to another man who was simultaneously grilling off the talo and wrapping them around the txistorra. Hot and fresh, from scratch, in a matter of seconds. Your basic talo. So simple: flour, water, salt, sausage. It's also popular at Santo Tomas, which takes place next week here in Donosti, and you can find it in some pintxo bars year round. But there's something about digging in in the middle of a crowd of people, with grease soaking through the bottom of your napkin, in the cold winter air, washing it down with cider from a bottle with no label. Mix the flour and salt, and begin incorporating water from the center, until you form a dough with the correct texture. Leave it to rest for 30 minutes and then make small balls. 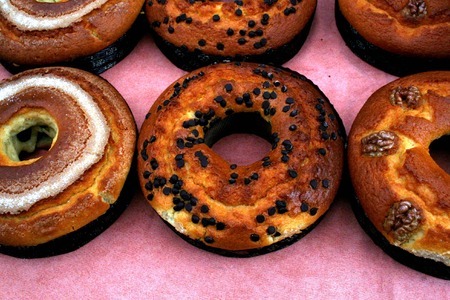 Roll them out with your hands from the center until you form a sort of thin round, which you then toast lightly on a griddle on both sides. Serve with fried sausage, morcilla, bacon, tenderloin, chocolate, etc.